Mary’s son, Ethan, has come straight out of the shower. The commotion in the hall has woken Mary. ‘I’m normally a bit more with it,’ she says, struggling to push herself upright. ‘But you see I had a restless night last night and I feel all...’ She smacks her lips drily and waggles her fingers in the air to illustrate. I explain who I am and what I’ve come to do. I work through the obs. Ethan brings in a tray of tea and then sits down in a low, fabric armchair to drink a cup. He’s the polar-opposite of naked now, wearing a heavy-knit, patterned sweater now, khaki trousers and sandals, all perfectly in keeping with the general, Nordic style of the place: wooden carvings of dragons, masks and heroic figures, prints and sketches, framed academic scrolls. Mary has a bearskin over the bed. When it comes to having blood taken she’s not quite so sanguine. ‘I can’t believe you’re ninety-five,’ I tell her, tapping around for anything remotely usable. When Lionel smiles it’s like the friendly gape of a wet-mouthed hound, the fleshy corners of his mouth a little sad and down. ‘Do come in!’ he says, but he doesn’t make quite enough room in the vestibule, especially as there’s another, inner door to open, and as I’m laden down with obs bag, weighing scales, folder and other things, we’re forced to do a little dance in the limited space available. We manage to get the door closed, and stand together in the main hallway, an impressive room, with a geometrically tiled floor, an ornamental fireplace, and a chandelier hovering above our heads like some elaborate, crystalline spaceship. ‘If you’d like to come this way,’ he says. I follow him through into the living room. He sits in his armchair, and begins turning his wedding band round and round. He puts the book back on the table and folds his hands on his lap. Thanks very much for visiting Siren Voices again. I thought I'd put one last post up in a shameless attempt to persuade you to come over to www.jimclayton.net. It's much the same kind of thing - character studies (carefully anonymised), anecdotes, happy / sad vignettes... I think you might like it! Nine years and one thousand posts later, I’m writing my last item as Spence Kennedy. When I started Siren Voices I had no other ambition than to make a diary record of the people and situations I found myself in, to report what happened each time as sympathetically and non-judgementally as I could, and most importantly, to get myself into a routine of writing. For a long time no-one outside the family read the blog, which wasn’t surprising, because I didn’t do a thing to promote it. But I kept going, and it was gratifying to see the word-count build up. I fiddled around with the style a few times, experimented with the voice. Innis, a good friend of mine (and a brilliant photographer), let me use some of his photos in the header. My writing style changed, and I started to feel easier about confronting the blank screen each time. The whole thing began to feel quite solid. Still, nothing else would’ve happened if my wife, Kath, hadn’t emailed Suzi Brent at NeeNaw. Suzi recommended Siren Voices, and suddenly I started getting comments! I was quite worried to begin with. I felt uneasy about writing under a pseudonym (‘Spence Kennedy’ because my mum’s dad’s middle name was Spence, and Kennedy because I was reading The Big Picture by Douglas Kennedy at the time). I knew how important it was to protect patient confidentiality, but I couldn’t think how I’d be able to maintain the degree of intimacy that I wanted if I had to ask a patient for permission each time. The easiest thing seemed to be to change identifying details and stay anonymous, even though I really wanted to be honest about who I was. 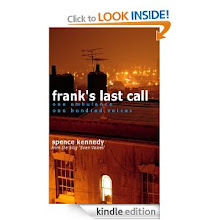 In the end I decided to stay writing as Spence Kennedy. Years passed. I became two people: Jim Clayton at work; Spence Kennedy on-line. It all seemed to balance out. I didn’t want to do anything that might jeopardise the blog. 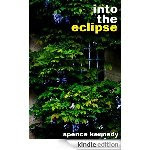 When it came to self-publishing my first books, I stuck to Spence Kennedy because I thought the only people who might feasibly buy & read them were the followers of the blog. It was frustrating not to publish under my real name, but then again, I figured that I wouldn’t be in the ambulance service all my life. When I left, I’d be free to pull off the mask and start writing as myself. So that’s what I’m about to do! My day job will be with the Community Rapid Response Service – working alongside Occupational and Physiotherapists, District Nurses and so on, helping patients avoid hospital and stay at home. I won’t be blogging about my work with the CRRS, although if I come across some interesting stories I might conduct a more open interview and get permission from the patient before I publish. The new blog will be much more general, I think. A collection of sketches, poems, stories – anything that occurs to me. I’ll try to make it as entertaining and interesting as possible, with more pictures and clips than before. I look forward to hearing what you think. I won’t be posting on Siren Voices any more, but I will keep the site open for people to read and comment on if they want. I’ll certainly publish any comments that come in, and make a few of my own. I’m proud of what Siren Voices represents: as true a picture of life on a front-line ambulance as I could make it. There are so many people I need to thank, I hardly know where to start. My wife, Kath, for reading everything and editing it into some kind of meaningful order. Blogger has been a great platform and I recommend it thoroughly. But most of all I’d like to thank everyone who’s ever read, followed, commented or Tweeted about Siren Voices over the years. I really couldn’t ever thank you enough. I hope you all stay in touch, because I feel like I’ve made some good friends over the years. Here’s to the next nine years! Early summer, a high blue day in May, bright and full of hope. Which made me feel worse, of course. I’d been in the ambulance service a year, working the non-emergency side of things, ferrying elderly patients to and from day centres, outpatient appointments. I liked the work. It was therapy after training to be an English teacher in a secondary school and crashing out in my second year. I was a failure, on the run from myself, from the Smoking Ruins of my One Last Chance at a Career. I’d taken the whole teaching disaster particularly badly because I’d always thought of it as my Ace, the one, sure-fire card I could play if things got tough. When it turned out to be the Joker, I panicked. To begin with, the regularity of patient transport helped me feel less anxious about things. It was simple, practical, obviously useful. I was in amongst an entertaining bunch of patients who eased my bruised sense of connection with the world. If I was hopeless at everything else, at least I could drive a bus, chat to people, wheel them about. I had plenty of time to read. I stared out of the window as the world flew by: pylons, houses, trees. After a while I started to feel restless. I wondered what it would be like to work on a frontline ambulance. Maybe I could turn myself into the kind of person you got when you dialled 999, the kind of person who’d Be Cool and Sort Things Out. I applied for the EMT course but there were delays. It was a frustrating process. Administrative snarl-ups, rules that changed overnight, interviews that went well but led nowhere – bureaucracy rising up like thorns round an enchanted castle. In the meantime I started this blog. I’d always loved reading, and for many years I’d fancied I could write something. Every time I’d tried in the past, though, the project had fallen apart. I didn’t seem to have the tenacity to see it through. A lack of sticking power. Someone said that about me once. Were they right? Was that the common denominator in my ho-hum working life so far? Maybe writing a blog would help. A useful distraction at least, a way of cultivating a more objective view of the world. Focusing on other people was patently a good thing. I was too self-obsessed. I was like that guy in An American Werewolf in London, except when I fell screaming to the floor I wasn’t turning into a monster but a moany old git. The other thing was that blogging felt like a useful way of sneaking up on writing, doing it without it being a thing. Blogging was endless. It was practical. It was audience-less, too, for a while, but at least it was ‘out there’. People could take it or leave it – comment, in time, if they wanted. I could desensitise myself to criticism. And I’d be spared the terror of the finish line, the crashing moment when something would be done, judged, found wanting. I decided to blog about ambulance work. And as it turned out, Nora was my first subject. I remember walking alongside her as she shuffled with sticks from the day centre to the ambulance. I was intrigued by her accent, by the aura of contrariness that bound her as tightly as her scarf. The nurses were scared of her. They smiled when I said goodbye, but I half-expected to see them cross themselves as they turned away. An interesting case, I thought. I bet she’s got some stories. I was attending, so I had plenty of time to grill her in the back. I’d get to hear all about it, the country she came from, the love affairs and hazardous escapes, the heartbreaking family break-ups, the inspirational recoveries. It was a long way back to her house. I’d get a comprehensive life history. I made sure she was. I was ready to be the chatty ambulance man, innocent, open, inquisitive. Ready to memorise the good stuff. Nora was as brutal as a hip replacement. ‘Why do you want to know these things about me?’ she said. The rest of the journey I was back to staring out of the window. When I got home that evening and sat down to write my first blog entry, I stared at the blank screen and rubbed my face. I reviewed the day, moment through moment, trying to visualise each patient, what they looked and sounded like, where we picked them up from – any angle I could think of. But the one who really stood out was Nora. For want of anything else to write about I gave in and wrote a short paragraph about what had happened. Later, when I read it back, I saw that the reason she’d made such an impact was because she’d subverted my expectations. She hadn’t behaved like I wanted her to behave. Despite my best efforts she was simply Nora. Crotchety, complaining, cussed old Nora: headscarf, two-sticks, murderous demeanour. I carried on and wrote a few more, one a day. And when I felt brave enough, I posted them. There were no comments, of course, but I didn’t mind. I’d made a start. I was getting myself into a habit of writing, a habit of thinking about writing, and it felt good. I suppose as a first subject, it’s ironic that Nora was so flatly uncooperative. But like it or not she’s there at the beginning, a quirky kind of guardian, perhaps. Cerberus in a Headscarf, focusing her fury, challenging me to get past with what little I had, to struggle on regardless and get something written. I suppose, as figureheads go, that’s actually not too bad. We’re on our way to a routine job when we spot them: two men, struggling to help up an elderly man who’s sitting on the pavement. They’re looking around for help, presumably to ask someone to phone for an ambulance. We pull up alongside. I open the cab door and climb out. The first guy takes a moment to register who I am, stunned by the fact he’s only had to think about an ambulance for one to show up. ‘Can you help us?’ he says, struggling with the guy, an old man in a khaki cap and shiny overcoat. There’s an unzipped holdall beside him on the pavement, the neck of a bottle of whisky poking out of the middle, conveniently to hand. ‘Can you take over?’ says the other guy. ‘No worries,’ says the first. I thought they were together, but after exchanging a brief, rather surprised look, they walk off in separate directions. After we’ve reassured ourselves the old guy hasn’t hurt himself, we help him up and, guiding his legs giant-puppet-style, we walk him up the ambulance steps and land him safely on our trolley. Rae fetches in the holdall. His head lolls from side to side, his eyes open but unfocused. He turns his face in the approximate direction of my voice and opens his mouth to talk – or rather, he tips his head back and releases a gargle of unshaped sounds, floating out on a cloud of vapours. Once he’s decided enough noise has been made to satisfy the request for information, he stretches his lips a little more to reveal a motley collection of stumps, and laughs. Even if it wasn’t for the bottle of whisky you’d guess he was drunk. A distillery would smell sweeter. ‘George!’ says Rae, who’s found a bus pass in the holdall. The effort of saying his own name exhausts him. He deflates into sleep, slides a little down the trolley, his cap pushed forwards across his face. I give him a pinch and take his cap off, and he’s suddenly awake again, paddling his arms in the air like the Moro reflex in a baby. ‘Marrghm!’ he cries out, his eyes wide open again, staring up at me. If he thinks I’m his mum, no wonder he’s surprised. Given his age, she must have been dead these past twenty years. Moira looks fine now. A vivacious, middle-aged woman, dyed orange hair, purple sunglasses, as confiding and friendly as a counsellor or librarian, but dressed for action in a yellow tracksuit top, red jogging bottoms, and a t-shirt that says: Pain is temporary; victory lasts forever. She stands up, takes off her tracksuit top, and holds her arms out. With her right hand she waggles the loose flesh below her left arm. She sits back down and has another sip of water. I finish writing the paperwork. I hand her the patient report form. She laughs, and flexes her arm. Agnes is lying on the floor where she slipped out of bed sometime in the morning. She hasn’t hurt herself. There’s plenty of room and she has some strength in her arms and legs, so it’s an easy thing to use the inflatable cushion and get her up. She stands, stiffly but well enough, walks unaided into the front room where she sits in her chair with an appreciative sigh. Ian, her PA, watches from the doorway. Agnes looks at me and winces. He’s off again! she says. He steams on in this vein. I ask him to fetch in Agnes’ medication, just to get some space to ask Agnes if everything’s all right. It’s a strange situation. The flat is neat and tidy. Agnes seems happy enough in herself, and we haven’t seen any signs of bruising that might indicate physical abuse. She’s warm, well-fed. There are rails on the walls, a wet room, toilet surround, walking aids. The daughter’s already been on the phone. She sounded caring, interested, in touch. Ian’s stress seems completely disproportionate. He comes back in with the blister pack and hands it to me. His face is taut, waxy; his expression guarded. I wonder for a minute if he’s about to cry, but he launches into another bitterly intense description of the state of affairs. I have to speak over him to have a chance of asking specific questions, or finding out how things stand. ‘What’s the difference between a Personal Assistant and a Carer?’ I ask him. He launches into a long, scattershot complaint, covering everything from shopping arrangements to difficulties with the new bed, missed appointments, misunderstandings, unsatisfactory consultations with the doctor – and at every point, standing at the margins of his unhappiness like some malign shadow, the figure of the daughter. Ian must at one point have been a good match for them as a family. There’d be no other reason why they’d take him on as the single carer for the mother. But it’s hard now to see why that would have been the case – and equally hard to understand why he’s still there. Surely the daughter can’t be unaware of his level of discontent? Or is this new today? I suggest to Ian that we make a Falls Referral. I tell him I’ll make a note that the level of care also needs looking at. We say goodbye to Agnes and head out. ‘I need a smoke,’ he says. He goes as far as the grass verge, then lights up and starts pacing around, shooting us glances, smoking furiously, intermittently checking his phone. I make the referral. I’m a little uneasy about the whole thing, but at least someone’s coming in. After all, maybe this is just a particularly bad day for Ian, and we don’t want to stir things up unnecessarily. It’s never clear cut. When I’m done I put the clipboard on the dash, glance over to Ian again and wave. He nods, takes one last drag of his cigarette, flicks it away into the road and then exhales such a cloud of smoke it looks for a moment as if his head has exploded. Then he turns and marches back inside. Ken’s heart is skipping like a syncopated jazz score. It’s almost certainly the reason he collapsed. For some reason the on-demand pacemaker he had fitted just a couple of months ago hasn’t kicked in, so we’re taking him to hospital to have it checked. He rests back, laces his fingers across his belly, and closes his eyes. He flexes his jaw, like he’s testing the shape of the words he’s about to say. Sunlight flickers in through the slatted ambulance windows. There’s a warm and boxy feel to the afternoon, closed-in, sleepy. I ask him about all the paintings back in his house. Watercolours of harbours, fishing boats, country scenes, churches. Ken shakes his head, then turns and gives me another stern look. Cara, Jake’s support worker, is waiting for us in the lobby of the health centre. As soon as she sees us walking up the path she brings him out to meet us. They’re a curious pair, both middle-aged, but whilst Cara is neatly dressed, bright and sharp, clipping along in a hacking jacket, ethnic scarf and pixie boots, Jake is rolling beside her, morbidly obese, covered rather than dressed, everything black – black t-shirt, black tracksuit bottoms, black anorak, the striking blackness of it all emphasising the pallor of his face. Jake seldom goes outside his flat, or even out of his chair. On top of all his other health problems he’s suffered a DVT. The doctor has ordered him straight into hospital for a scan, but even though Jake’s left calf is as tight as a red balloon, covered in a pruritic rash he’s scratched into a scabby mess, he’s still reluctant to come with us. We have to tempt him onto the ambulance with a string of blandishments, keeping him talking whilst we quietly put on his seatbelt and gently pull away. With me one side and Cara the other, we keep him in a cross-fire of reassurance for the short journey in. The ambulance rocks violently as we turn up the ramp into the A&E car park. ‘But I don’t want to be here,’ he says. ‘Come on, Jake,’ says Cara, holding out her hand to him at the bottom of the steps. Eventually he gets up and moves to the back of the ambulance. He stands in the doorway with his hands either side, staring out, massive, bloodless white, taking in the horrifying activity of the ambulance bays, the fuss and clamour of it all, like an albino Orang-utan being coaxed out of the forest into the city. ‘I want my tea,’ he says.